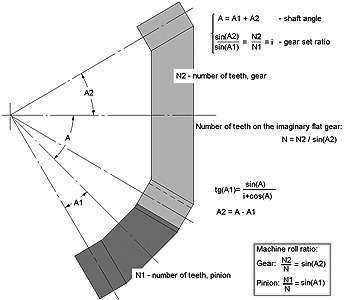 Machine summary calculation for production of spiral bevel ZAKgears. 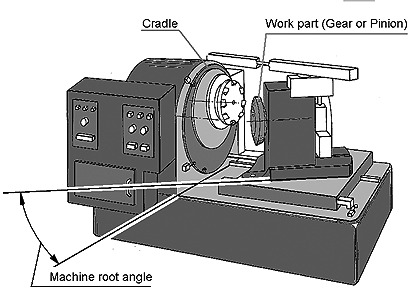 ZAKGEAR machine roll ratio and ZAKGEAR machine root angle. 1. RPM of the machine cradle / RPM of the work part (gear or pinion). 2. Number of teeth on the ZAKgear that you cut / number of teeth on the imaginary flat generating ZAKgear. Geometry of ZAKGEAR spiral bevel production method. Click on image to enlarge.